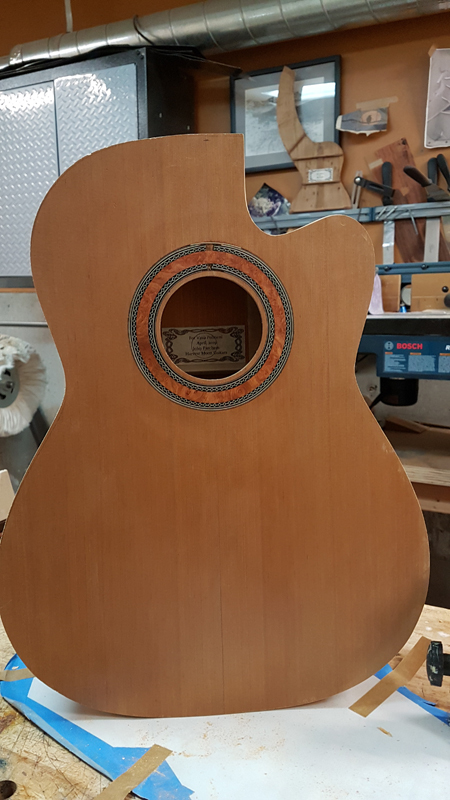 I am making a new classical guitar with pernambuco sent to me by my client. I have never used it before. I need to make a three piece back as you can see in the picture. I tap tested the wood as I was getting very clean tap tones. I have not tried it on this narrow of a piece. I could not really determine the LC frequency so I populated it with a nominal value. The wood is dense at 978 kg/m^3, yet rather stiff, Elong is 23.5 Gpa. The spread sheet gives me a thickness target at about 2 mm. I think this is all correct, the long and cross tones were really clear. Has anyone else used pernambuco for a back? Here is the entry in wood database, I see my results are close. Lovely looking stuff. I have never had it in my hands. The pattern reminds me of some cypress sides I have had. 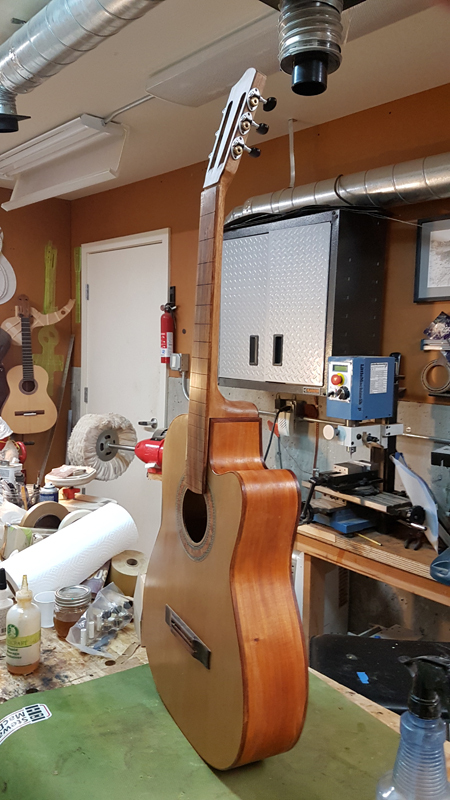 Jim Frieson has done a number of pernambuco classical guitars and has posted at least two with three piece backs on the decamp forum as well as at least one with a two piece back. I don't recall seeing him on here. I doubt that he uses maths for deciding the thickness however. Thanks Simon, those posts were really helpful as I like the way Jim laid out the three piece back. John, I am assuming you're going for a live back because you're computing a target panel thickness. 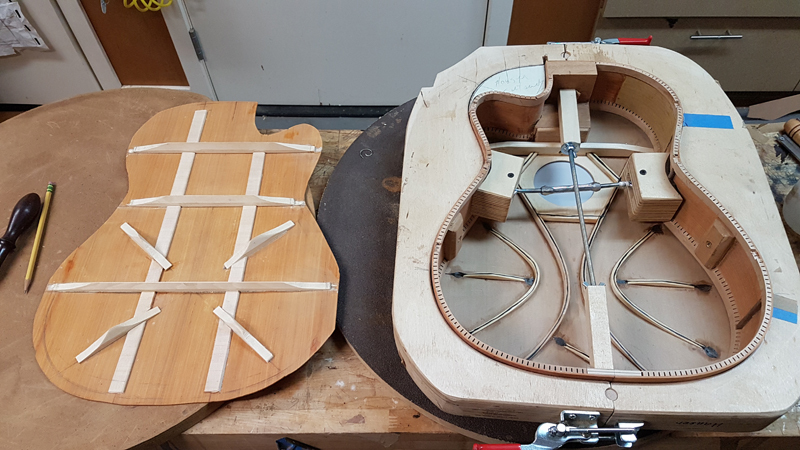 Check what the back panel mass will turn out to be and then compare that with other live back guitars you have made. I'm suspecting that the pernambuco might be too dense and therefore have too low a monopole mobility to get a decent live back without going somewhat thinner on the back (to get the mass down) and stiffer on the bracing to make up for the stiffness you lose in the panel. 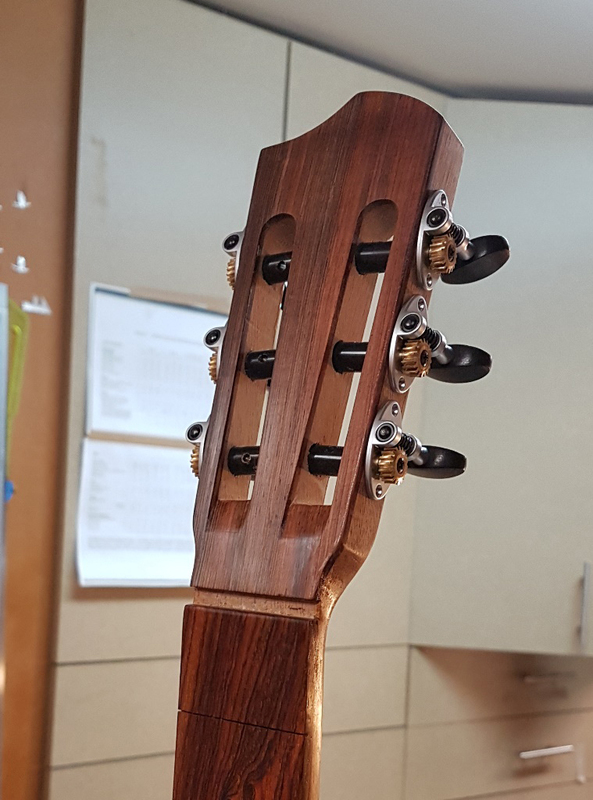 not the help you need, but i´m building a pernambuco guitar ATM - i didn´t do frequency tests as i´d thought it would be too heavy for a live back (mine is above 1 g/cm3). i can tell you that the wood is a PITA to plane, and showed a lot of spring-back after bending. a further nuisance is that the wood´s lovely color (mine seems to be stronger than yours, maybe the pic?) comes from a pigment that's actually a pH indicator. the water here is rather alkaline and after bending (i spritz it with water and wrap it in foil) it turned a rather bold purple, not the nice red-orange it started with. so my advice is to use as little water as you can and use distilled (or slightly acid) water. in my case i had to wrap it again, this time wet with diluted lemon juice, and apply judicious sanding to make it orange again. by the way, HHG doesn't make it purple, but titebond seems too. I did get a good back response from my 2 panama rosewood backs, they also were dense at 908 kg/m^3 but stiff El 20.7 Gpa. This back is dense at 978.5 Kg/m^3 but a little stiffer El at 23.5 Gpa. The target thickness for the panama rosewood was 1.93 and the target stiffness for the Pernambuco is 1.99 mm. Being somewhat lazy I removed area from my calculations for comparison as it is the same and multiplied target thickness times density for comparison I get 1.95 for the pernambuco and 1.75 so the mass of this top will have about 10% more mass. 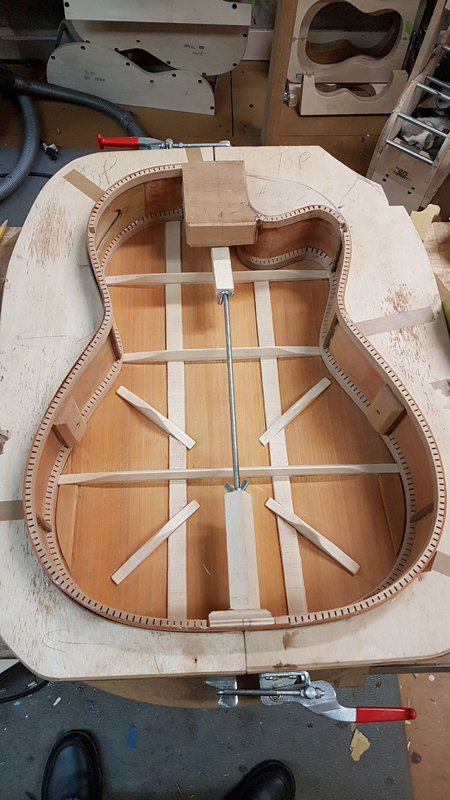 I will take your suggestion and make the back 1.9 mm, which puts its mass fairly close to a know good back, and increase the height a the lower back braces a touch. mqbernardo, I will take your advice with regards to working with the wood. Luckily in Seattle our water is all fresh snow melt. I have avoided foil for awhile as I have found that the aluminium reacts with a bunch of wood. I use paper towels or kraft paper instead. 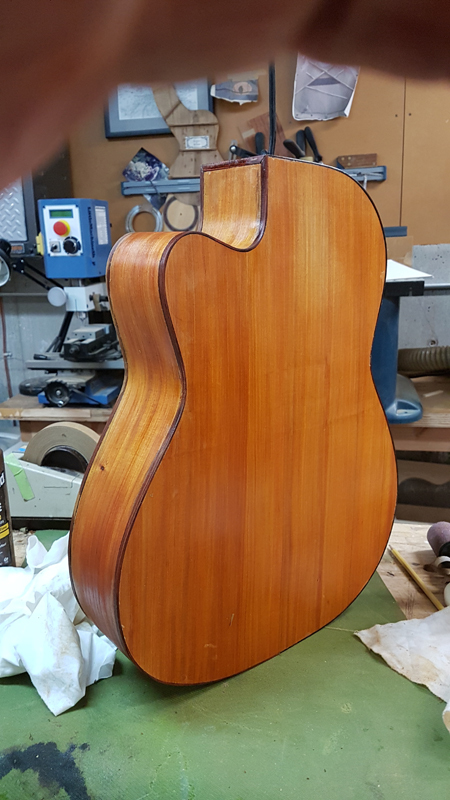 Today I bound the body of the guitar with the three piece pernambuco back. This is a contemporary classical edging on being a crossover with a 49 mm nut. 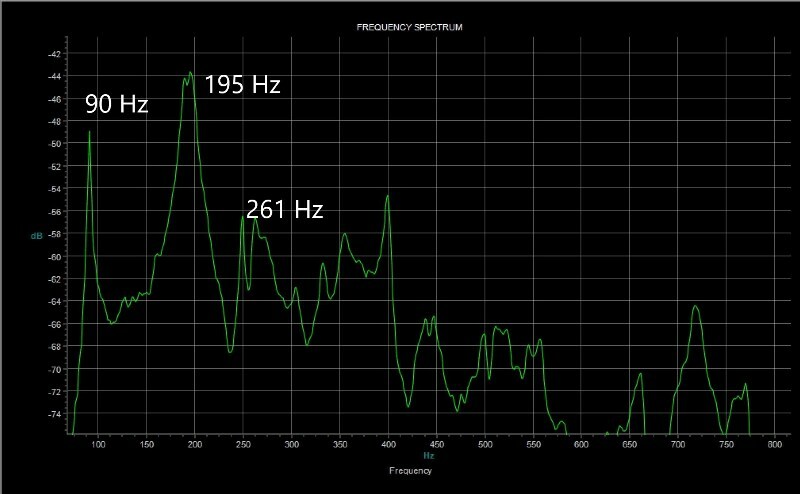 I took my first tap and was happy with the results without a bridge I am at T(1,1)1 90 Hz T(1,2) 195 Hz and T(1,3) 261 Hz. 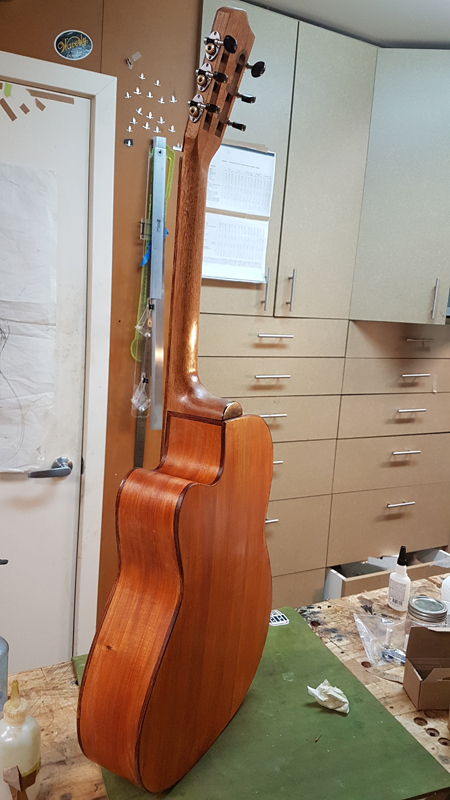 I get a pretty good response from the back and suspect it will get better when I tune it down a bit. On all of my classical falcate guitars I end up pretty close to where I tap with the bindings on. I find that the bridge raises the T(1,2) and the strings lowers it. I suspect when I tune down the the back the T(1,2) will end up at about 190 Hz. Should be T(1,1)1 90 Hz T(1,1)2 195 Hz and T(1,1)3 261 Hz. John I like that you are doing a cutaway classical. 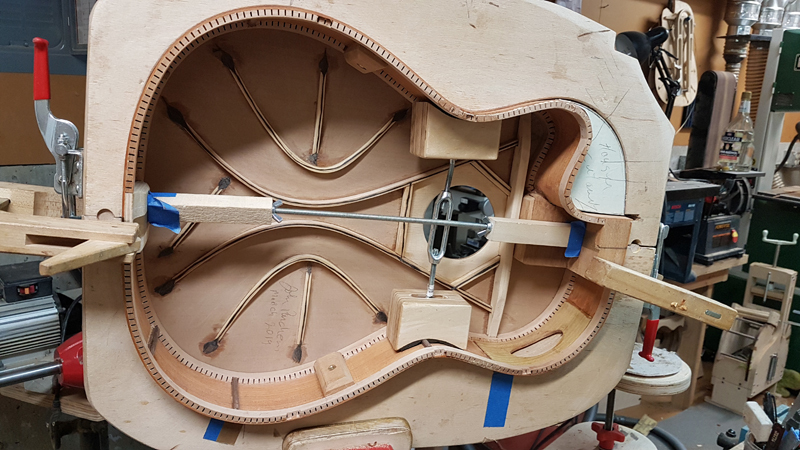 I have decided that by default I will always do a cutaway since as a player it is so much nicer to use. As an aside, as you probably know Pernambuco is/was the favoured wood for violin bows. Usually looking darker than your sample. Dave, I got the wood at Cook Woods https://www.cookwoods.com/. The pernambuco really darken with age. The board that came in was a very different color than the surfaced wood I have now. It has the stiffness and density I would expect. Here is where I am at. I need to do the final prep for finishing. I am getting excited. As a reminder this is a falcate braced classical. 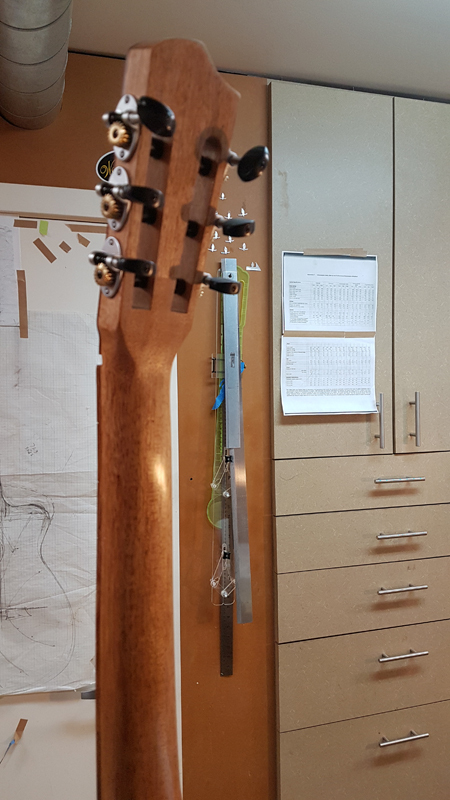 It has Western Red Cedar Top, three piece pernambuco back and sides, BRW headstock veneer and bridge, cocobolo fretboard and binding.